A quick summary as we prepare for the Owls’ fourth game in three days! After dropping the Baton Rouge Regional opener to Southeastern Louisiana University (SLU) 12-6 Friday night, the Owls paid the Lions back Sunday afternoon by beating them 9-5 and eliminating them from the NCAA Tournament. The Owls will have a short rest before playing unbeaten Baton Rouge Regional hosts Louisiana State University (LSU) at 8 tonight. 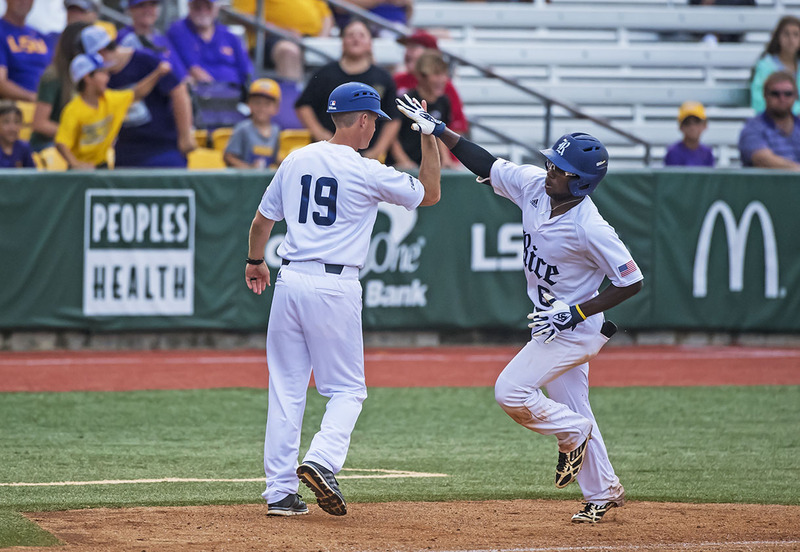 Rice (2-1) will need to beat LSU (2-0) twice in the double-elimination format, once tonight and again Monday to advance to the NCAA Super Regional. Addison Moss will get the start against LSU. The Lions took an early 1-0 lead in the top of the second inning, but Rice bounced back with a five-run third inning, which was capped by Dane Myers‘ three-run home run to dead center to give starting sophomore pitcher Kendal Jefferies a little room to work with against SLU. However, SLU answered quickly in the top of the fourth inning when Taylor Schwaner hit a two-run home run. Like Myers’ homer, Schwaner’s was a 400-plus foot shot to center field, which cut the Rice lead to 5-3. With one out in the bottom of the fourth, Charlie Warren doubled to right center. Two batters later, Ford Proctor singled to right and scored Warren, which brought the tally to 6-3 and ended Lions’ starting pitcher Carlisle Koestler’s day. The Owls tacked on a run in the fifth inning to make it 7-3. With the bases loaded, two outs and a 3-2 count, Addison Moss’ grounder was bobbled for an error at second base and scored Tristan Gray from third. SLU did not go away quietly, though. In the top of the sixth inning, Schwaner doubled and was then driven in by another hard-struck ball by Carson Crites, making it 7-4. Jefferies was quickly lifted but had given Coach Wayne Graham 5 1/3 innings’ work, something the Owls needed desperately if they are going to make a run at winning the regional. Myers came in from third base to pitch, and Jeffreries slid over to take the hot corner. Trading runs seemed to be in fashion, as the Owls added a run in the bottom of the sixth inning. Ford Proctor singled and later scored on a fielding error, making it 8-4. The Lions’ Ryan Byers made it 8-5 in the top of the seventh inning by hitting a one-out Myers pitch over the right field wall. That would end the Lions’ scoring for the game. Rice added a run in the bottom of the eighth inning, as a Myers double drove in Chandler from first to make it 9-5 and the final score. Coach Graham addressed the media after the game, watch by clicking below. If the YouTube player is not appearing in your browser, click here. The weather could be an issue tonight. Watch the game at 8 p.m. on ESPN3.com the SEC Network and follow along on Twitter @RiceBaseball. A good sighting by university photographer Tommy LaVergne today: Alum Chris Blache, recently featured in Rice Magazine for his Mississippi River boat pilot work, was in attendance rooting on the team today. Read the story here (page 36). View photos from the game by clicking on the Flickr gallery above. To enlarge the gallery, click on the image again or on the four-arrows button in the lower-right corner. If the gallery isn’t appearing in your browser, click here. 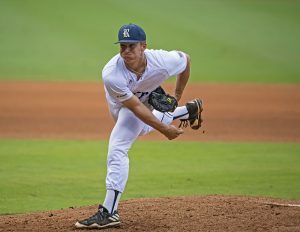 With the squad’s season on the line, the Rice baseball team battled back from an early 5-0 deficit (as well as an 82-minute rain delay) to claim an eventual 13-6 victory over crosstown foe Texas Southern University (TSU) in an elimination game at the NCAA Tournament Saturday afternoon in Baton Rouge, La. With the win, Rice now 32-30 overall, stays alive in the regional and next meets the loser of Saturday’s late game – the winners bracket clash between Louisiana State University (LSU) and Southeastern Louisiana University. The Sunday (June 4) Rice game, another possible elimination game for Rice, is scheduled to start at 3 p.m. Both the Owls’ and Tigers’ respective seasons were on the line heading into the game. Texas Southern quickly struck for runs in both of the first two innings. Playing as the visiting team in the neutral setting of LSU’s Alex Box Stadium, TSU scored three runs in the top of the first inning. Each of the first five Tigers in the batting order reached base with four singles and a hit batsman. The Tigers were back on the offensive for two more in the second inning. Charles Guillory was hit by a pitch to lead off the frame and then moved to second on Horace LeBlanc’s sacrifice bunt. Guillory scored on Karmen Dukes’ double down the left field line. Dukes came home on an RBI single by Gerrick Jimenez to stretch the margin to 5-0. Rice rallied to tie the score in the bottom of the second. Tristan Gray led off with a solo home run to right field and tied the team lead with seven round-trippers. The Owls then mixed a pair of hits around four walks and two hit batsmen issued by the Tigers. When the dust cleared, the game was leveled 5-5. Both teams registered single runs in the fifth. A Rice fielding error to start the frame led to an unearned TSU run. Rice countered with a solo homer from Andrew Dunlap to even the score 6-6. Dunlap’s sixth blast of the year was before a one-hour, 22-minute rain delay. Junior pitcher Willy Amador came up big, keeping the TSU bats in check for 3.2 innings; but when the game restarted after the rain, Rice took Glenn Otto out of the bullpen. The right-hander from Spring, Texas, proceeded to fire 3.0 scoreless frames, scattering two hits and a walk while striking out three. In the bottom of the seventh, the Owls sent 11 to the plate on the way to six runs on six hits. The big blows were a solo homer from Ryan Chandler to start the outburst. Gray then connected for his second home run of the day, finishing the game going 3-for-5 with a career-high-tying five RBIs. 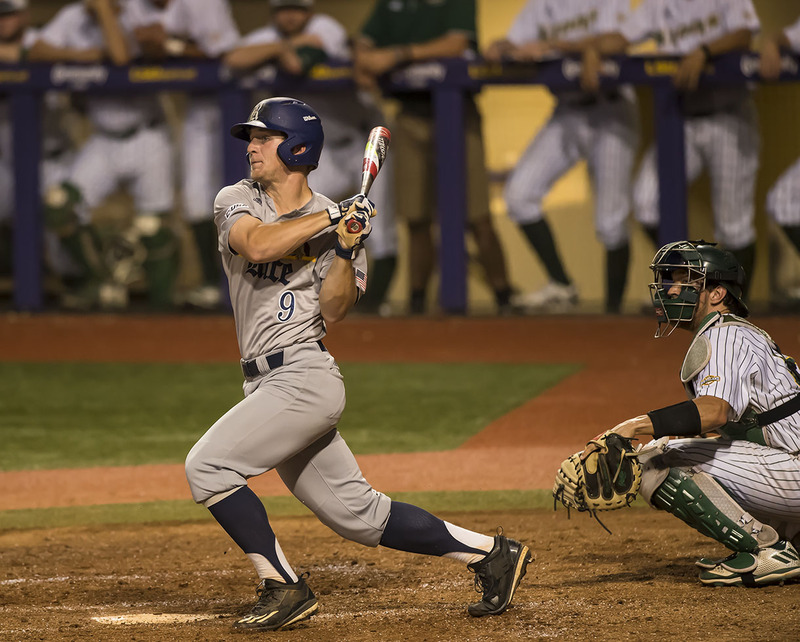 He was one of three Rice players with three hits in a 17-hit attack. Every Owl also scored at least one run, and the Blue & Gray still left a season-high 16 players on base. Rice added one more run in the eighth to extend the lead to 13-6. Sophomore right-hander Jackson Parthasarathy pitched the scoreless ninth for a 13-6 final. Texas Southern’s 2017 season came to an end. The Tigers finished the year 20-34 as champions of the SWAC Tournament. Pitchers: Texas Southern - Seth Oliver; Ryan Hawkins (2); Robert Loza (5); Jaime Vazquez (7); Fabio Gonzalez (8) and Charles Guillory. Rice - Zach Esquivel; Willy Amador (2); Glenn Otto(6); Jackson Parthasarathy (9) and Dominic DiCaprio. HR RICE - Ryan Chandler (5); Tristan Gray 2 (8); Andrew Dunlap (6). R. Loza faced 3 batters in the 7th. Stat of the day: After tonight, Rice kept another streak alive: The Owls have never gone “two and barbecue,” meaning Rice has won at least one game in all of its 23 consecutive NCAA Regional appearances. Head coach Wayne Graham, Chandler and Otto addressed the media in a postgame news conference. Watch the video below. If the YouTube player doesn’t appear in your browser, click here. Although the Rice baseball team had more hits than Southeastern Louisiana (12-8) in Friday night’s opening round of the NCAA Tournament in Baton Rouge, the Lions claimed a 12-6 win over the Owls to advance to Saturday’s winners bracket. Rice, now 31-30 on the season, faces Texas Southern in the losers’ bracket of the double-elimination tournament. Start time against the crosstown Tigers, who are 20-33 after falling to regional host LSU by a score of 15-7, is set for 2 p.m. Saturday at Alex Box Stadium. Southeastern Louisiana jumped on the scoreboard for a pair of runs on one hit and three Owl fielding errors in the bottom of the first inning. Rice answered with a run in the top of the second after Tristan Gray led off with a single and scored on an RBI single by Charlie Warren. After a solo home run by the Lions in the third, Rice still managed to tie the score in the fifth on a two-run long ball to left by Dayne Wunderlich. The Brenham, Texas, native’s sixth home run of the season made it a 3-3 game, but that proved the closest the Owls would get the rest of the way. The Lions exploded for four runs in both the fifth and sixth innings to take an 11-3 advantage. Rice continued to fight and plated two more runs on four hits in the top of the seventh to make it 11-5. 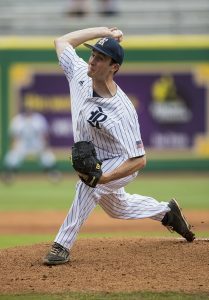 Southeastern Louisiana added a final run in the eighth, one of four unearned runs in the game as Rice tied a season-high with seven fielding errors. 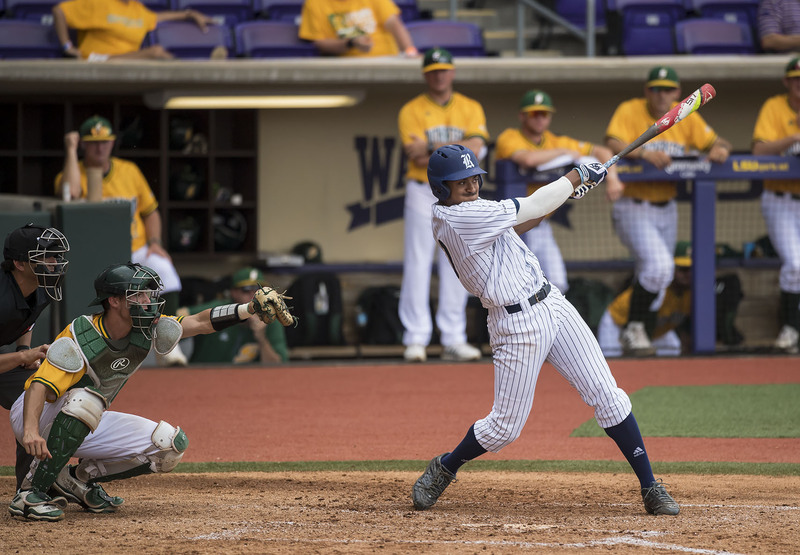 The miscues, along with eight free passes to first base from seven walks and a hit batsman, were too much in an NCAA Tournament setting. In the ninth, junior third baseman Dane Myers connected on a 3-2 pitch for a home run. His seventh homer cut the margin to 12-6, where it ended. Wunderlich went 3 for 4 on the day with a home run, two RBI and two runs scored. Four Owls had two hits in the contest. After the game, head coach Wayne Graham addressed the media in a brief news conference. If the SoundCloud player below doesn’t appear in your browser, click here. View photos from the game by clicking on the Flickr gallery below. To enlarge the gallery, click on the image again or on the four-arrows button in the lower-right corner. If the gallery isn’t appearing in your browser, click here. We also witnessed a career-first today. Hours after we had a little fun with Rice senior student manager Michael Kidd at breakfast in our morning blog, he went out and showed us and the rest of America his skills. 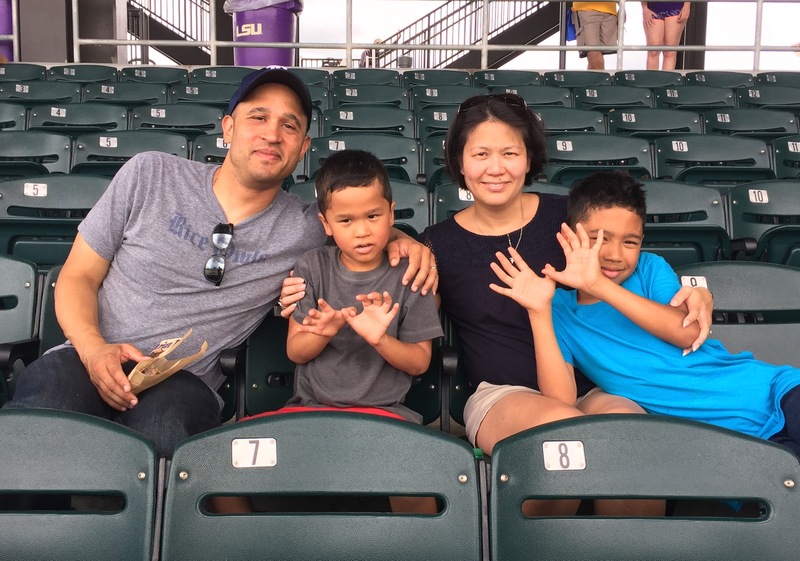 Sitting in the right-field stands of the Louisiana State University (LSU)-Texas Southern game with members of the Rice baseball team, Kidd caught his first-ever home run ball. As a matter of fact, he had never caught a foul ball, either. To make it more impressive, Kidd hasn’t really attended many games as a regular fan. He estimates somewhere around 25 in all. The moment came in the bottom of the seventh inning with LSU Tigers catcher Michael Papierski batting with one on and one out and the Tigers leading 9-7. “We arrived at the park and had to wait a little bit before we could go to the batting cages, so some of us went up in the stands to watch an inning,” Kidd said. “Papierski had fouled two off just to the left of us in the at-bat. He didn’t even get all of it (the home run hit); it was like a high pop-up and it was coming straight at me. I knew the ball was gone. It was just a matter of standing up and catching it. I didn’t have to move a foot to my right or my left. It just came straight at me. “It was really exciting,” he said. “The ball was coming at me, and I had to make a play on it. Some of the guys were behind me. I don’t know if they were kidding, but Chad Tatum and Ford Proctor ducked for cover,” he said. Watch Kidd’s home run grab, which was broadcast on ESPN3. H/t to John Sullivan for the game summary, Tommy LaVergne for the Flickr photos and Chuck Pool for the Michael Kidd video. On Thursday morning the Owls practiced for the first time, and it was no casual outing. 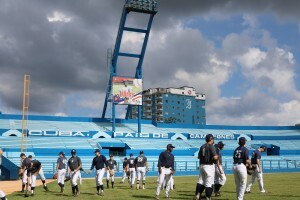 The team was allowed to train in the gem of Cuban baseball, Estadio Latinamericano in Havana. The facility is the regular season home of Los Industralies and the same venue where the Cuban national team hosted MLB’s Tampa Rays in an exhibition last spring that was attended by more than 50,000 fans. “They (the Cuban Baseball Federation) gave us a great honor to able to practice there today,” said Rice head coach Wayne Graham. “And it shows that the games we’re playing on this tour are as important in their eyes as they are for our program. That’s something. After practice the team had a (Thanksgiving) lunch consisting of an authentic Cuban culinary treat — chicken with rice and black beans. 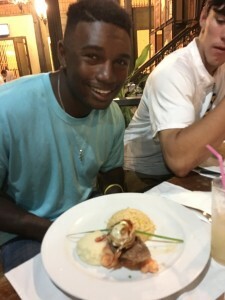 The Owls in fact went straight from the country’s national stadium to the restaurant in their practice uniforms, which was just fine with the baseball-crazed locals. 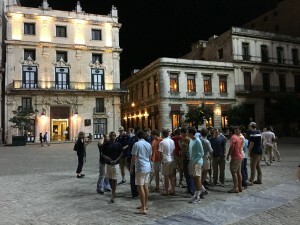 When the team returned to its Havana hotel, the players had an official class that the team has been taking all semester, and many of the Owls said it was the best one yet. 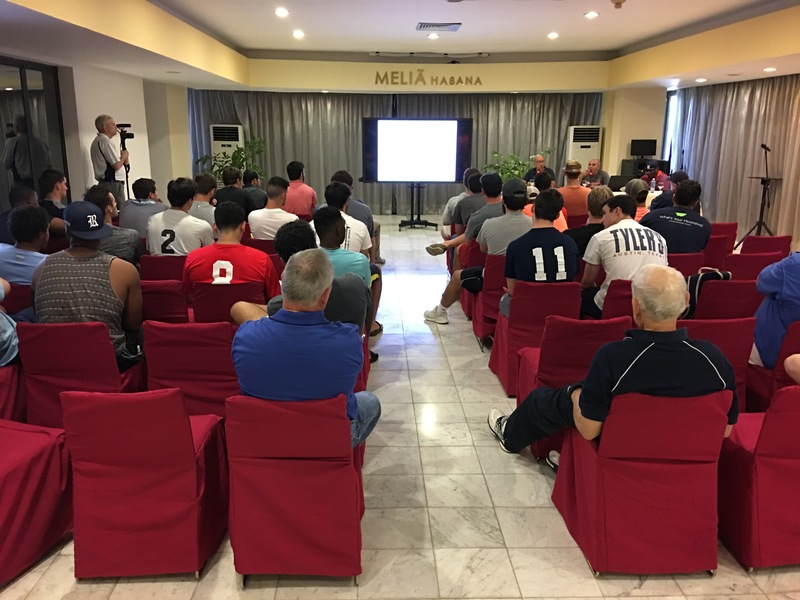 Rice Professor Luis Duno-Gottberg had the director of the Cuban Baseball Federation, Jesus Barosa, and the country’s pitching legend, Herberto de Armas, address the team (and coaches) about the history and structure of the sport in Cuba. At one point Barosa, with Duno-Gottberg translating, told the assembled Rice team that he attended their practice that morning, and that Rice’s “diligent approach to its training session shows that the players are well-coached … and I particularly liked your left-handed hitting centerfielder” (identifying junior Ryan Chandler). 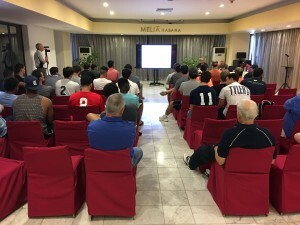 After a brief break, the team and traveling fans gathered in the hotel’s lobby and headed out for an unconventional Thanksgiving Day dinner at La Imprenta (The Print Shop). Dating back to the 18th century, the building used to house one of Havana’s main print shops for newspapers and the owner’s home before it began to “fall apart,” according to the host. The building was later renovated into the beautiful restaurant it is today. Sitting a few feet from the team was the last used printing press, which was made by The Chandler & Price Company of Cleveland. The team feasted on salad and soup and the Cuban version of surf and turf, followed by bread pudding, minus the rum, of course. Duno-Gottberg then directed the party back a different way to the buses so that the group could walk through the La Plaza San Francisco, one of many open spaces in the dense Old Havana. From there the team headed to Morro Castle and the Fort of St. Charles. 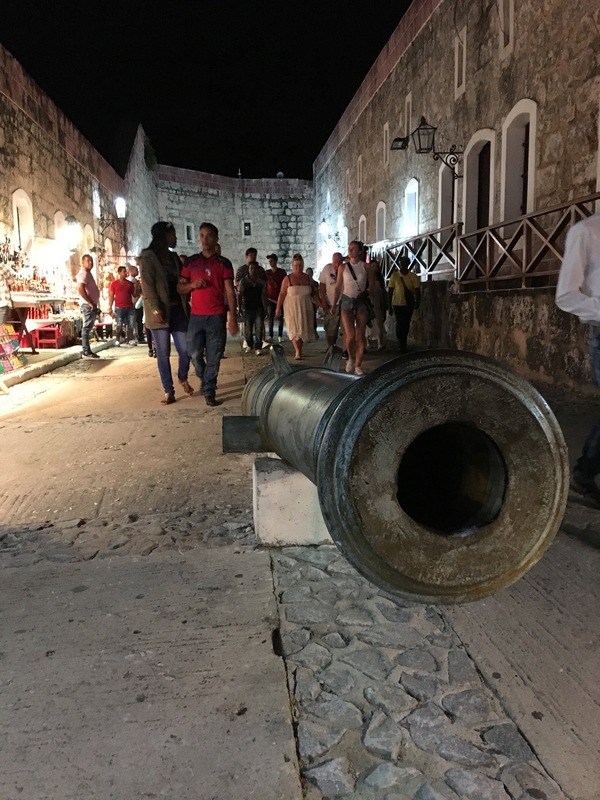 Morro Castle was erected between 1589 and 1630 to protect the entrance to Havana Harbor from pirates and foreign invaders. It is a classic example of Renaissance military architecture. For more than a century, the fort withstood numerous attacks by French, Dutch and English privateers, but in 1762, after a 44-day siege, a 14,000-strong British force captured El Morro by attacking from the landward side. The Castillo’s famous lighthouse was added in 1844. The Fort of St. Charles, or colloquially known as “La Cabana,” is the third-largest fort in the Americas and the largest Spanish colonial fortress in the Americas. The fort was built between 1763 and 1774 on a long, exposed ridge on the east side of Havana harbor to fill a weakness in the city’s defenses. When the British took Havana in 1762, it was by gaining control of this strategically important ridge; from here they shelled the city into submission. To prevent a repeat performance, the Spanish King Carlos III ordered the construction of the massive fort. Gen. Gerardo Machado and Fulgencio Batista (president from 1940 to 1944 and 1952 to 1958) used the fortress (presumably at different times) as a military prison. Immediately after the revolution, Che Guevara set up his headquarters there. Every evening at 9, actors in 18th-century military uniforms fire a cannon, but not before a 15-minute show that includes a drum corps entry. 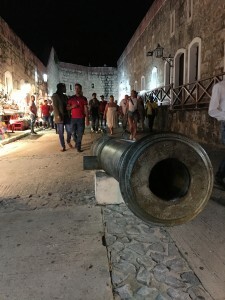 The cannon shot used to warn of the closing of the city gates. 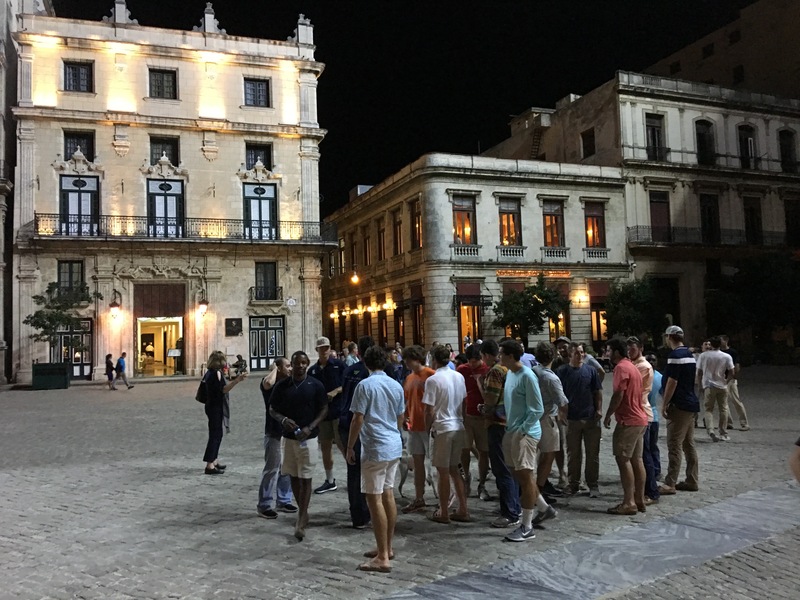 The Owls are certainly having a fun, cultural and educational experience in Havana, but there is also the matter of actually playing five games against teams in the Cuban Baseball League. After arriving Wednesday evening (Nov. 23), Rice is scheduled to play its first game Friday against Artemisa in the province of the same name 38 miles southwest of Havana. First pitch is set for 1 p.m. local time at Estadio de Guanajay. And in case you missed it from earlier today, after their first practice of their trip in Cuba, the members of the Rice baseball team sent a greeting home.